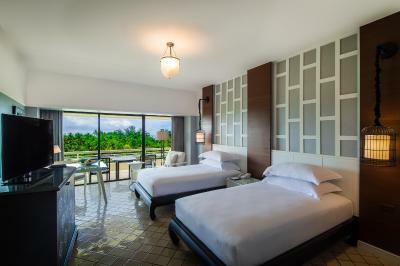 Lock in a great price for Hilton Phuket Arcadia Resort & Spa – rated 8.2 by recent guests! Nothing really. The experience was so disappointing that the Sea view from the room could not make up for it. Having stayed at the Hilton Arcadia a couple of years back, I knew what I was coming too. Incredibly friendly staff, fantastic location and a great hotel! It is very beautiful. I like the see-view room, it is capacious and comfortable. Swimming pools are very clean. People are kind and nice. Family friendly. Had everything we needed. Great beach. Awesome!!!! Breakfast catered to kids. BEAUTIFUL gardens. Superb staff. Wonderful pool and lobby. 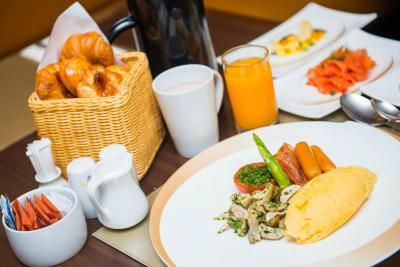 VERY good and plentiful breakfast. Off the bat we were greeted by very helpful staff and check in was quick and easy. We could have just stayed at the hotel if we wanted to, everything you need is there. The staff (from the front desk, to waiters, cleaning, room service) were so very nice. Several pool, bar, and retaurant options, magazine worthy views, great location, clean, spacious, we loved it! The restaurants have a great selection and food. 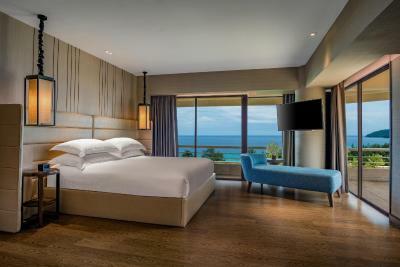 Hilton Phuket Arcadia Resort & Spa This rating is a reflection of how the property compares to the industry standard when it comes to price, facilities and services available. It's based on a self-evaluation by the property. Use this rating to help choose your stay! 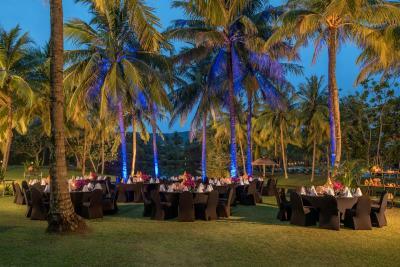 One of our top picks in Karon Beach.The beachfront Hilton Phuket Arcadia Resort & Spa is set on 75 acres of tropical landscape, offering perfectly maintained lush tropical garden views in front of the golden sands of Karon Beach. 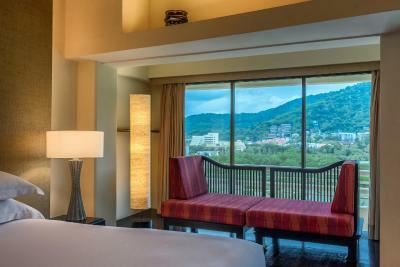 When would you like to stay at Hilton Phuket Arcadia Resort & Spa? Bright and spacious, this modern Thai-style room is decorated in rich warm colors. Includes a sofa, flat-screen cable/satellite TV and a dining table. The balcony overlooks the garden. 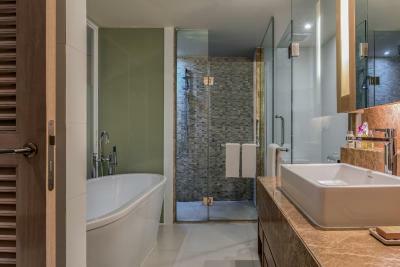 A private bathroom has a walk-in shower and bathtub. 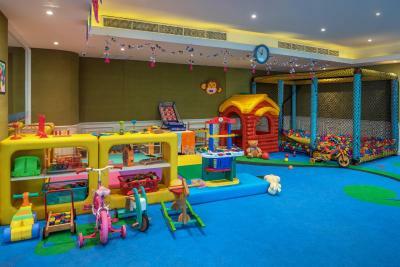 Can accommodate up to 2 adults and 2 children. 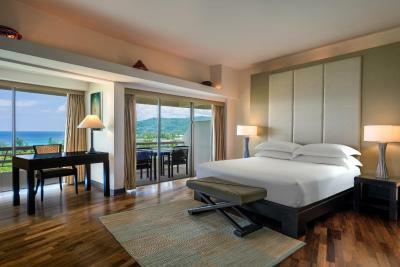 Bright and spacious, this modern Thai-style room is decorated in rich warm colors. Beautiful sea views can be enjoyed from the balcony. Includes a sofa, flat-screen cable/satellite TV and a dining table. 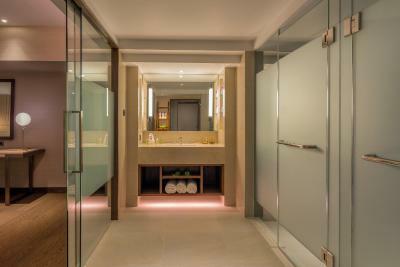 A private bathroom has a walk-in shower and bathtub. 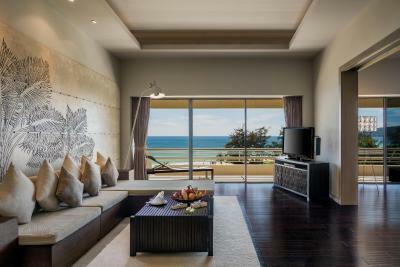 Spacious suite features sweeping ocean views from its balcony. Comes with a 30-inch flat-screen TV and movie channels. 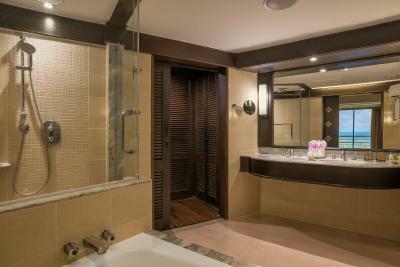 Large bathroom has a separate bathtub and walk-in shower, as well as fluffy bathrobes and slippers. 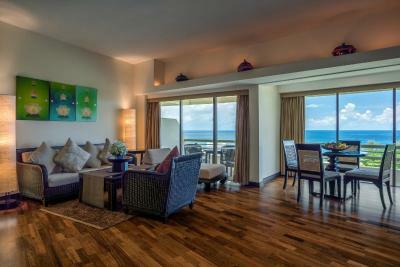 Spacious suite features sweeping ocean views from its balcony. Comes equipped with a 30-inch flat-screen TV and movie channels. Large bathroom has a separate bathtub and walk-in shower, as well as fluffy bathrobes and slippers. The balcony features views of the ocean and garden. 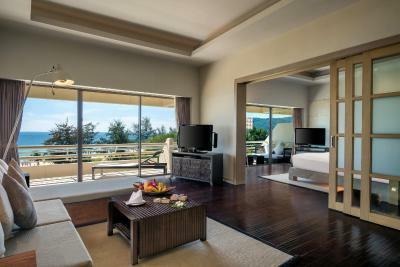 Spacious suite features sweeping garden views from its balcony. Comes with a 30-inch flat-screen TV and movie channels. 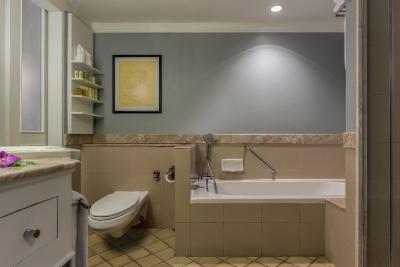 Large bathroom has a separate bathtub and walk-in shower, as well as fluffy bathrobes and slippers. 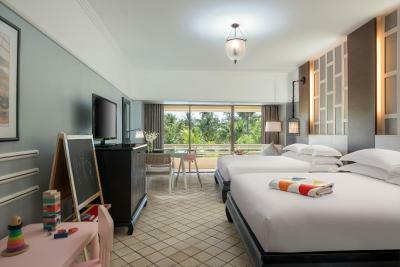 Modern and spacious, rooms come with a pillow menu, a flat-screen TV and spacious work space. Beautiful sea views can be enjoyed from the balcony. Bathroom has large mirrors, a walk-in shower and luxurious soak tub. 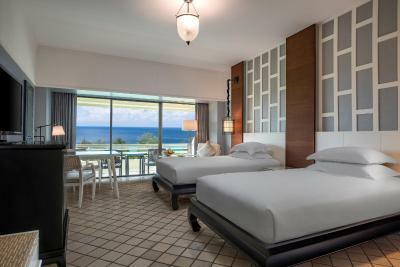 The spacious rooms have sliding patio doors. 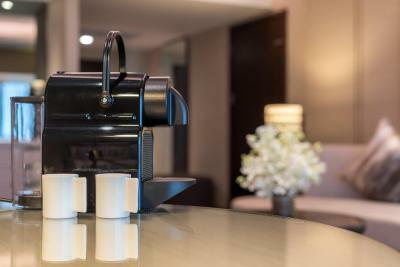 Modern and spacious, rooms come with a pillow menu, a flat-screen TV and ample work space. Beautiful sea views can be enjoyed from the balcony. Bathroom has large mirrors, a walk-in shower and luxurious soak tub. 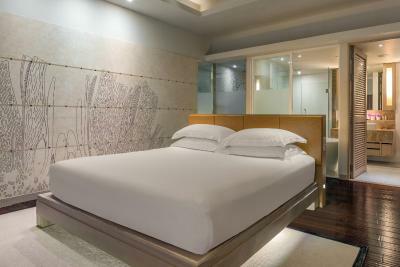 Modern and spacious, rooms come with a pillow menu, a flat-screen TV and ample work space. Beautiful garden views can be enjoyed from the balcony. Bathroom has large mirrors, a walk-in shower and luxurious soak tub. This bright and modern Thai-style room is decorated with rich warm colors. Beautiful garden views can be enjoyed from the balcony. Includes a sofa and TV. Please note that this room has a maximum capacity of 3 people. 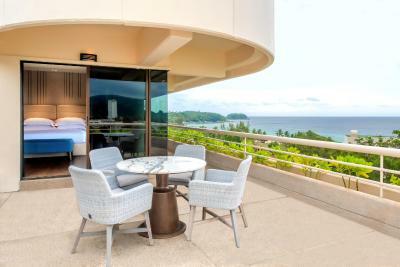 Spacious Thai-style suite features a large living room, dining area and a private balcony with panoramic views of the Andaman Sea. Suite includes a 40-inch flat-screen TV and DVD player. Includes access to Panorama Lounge. 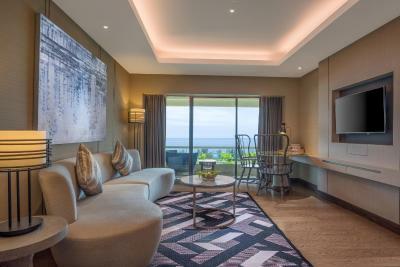 Overlooking the Andaman Sea or tropical gardens, this suite features Thai interiors, a large living room and a private balcony. A spacious bathroom has a walk-in shower and bathtub. Includes access to Panorama Lounge. 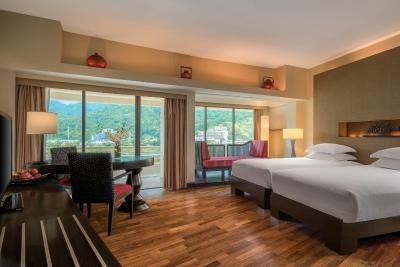 Please note that the Hilton Suites are in the Andaman and Saitong Wings of the hotel, and offer 2 different Thai-style interiors. 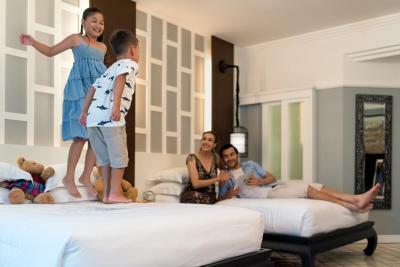 Offering ample natural light and space for up to 4 guests, the Deluxe Family Room comes with a seating area, a bathroom with separate walk-in shower and bathtub, and its own private balcony. 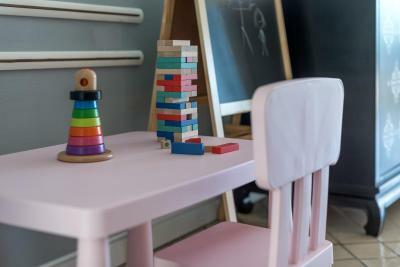 For families with young children, a choice of kids amenities is available to order prior to arrival or during check-in. The Oceanfront Hilton Phuket Arcadia Resort & Spa is set on 75 acres of tropical landscape, offering perfectly maintained lush tropical garden view in one direction, and world-class golden sands beach in the other. 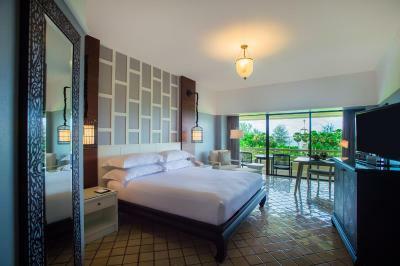 Facilities includes 8 Food & Beverage outlets for all tastes, a fully-equipped 24 hours fitness center, 3 tennis courts and 2 squash court for active guests, 5 outdoor swimming pools surrounding lagoons and palm trees. 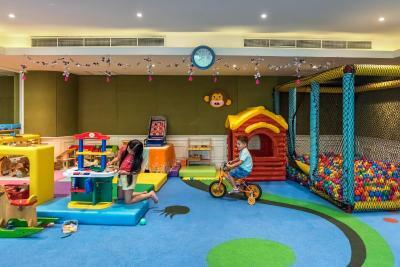 The resort also has kid-friendly attractions and exceptional facilities, such as two-level water slide, kids club with trampoline and ballroom and game rooms. 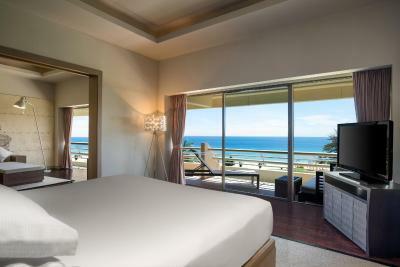 Ideal for a longer stay or romantic vacation; our contemporary Deluxe Suite rooms is situated right across the beach road, offering panoramic sea views. 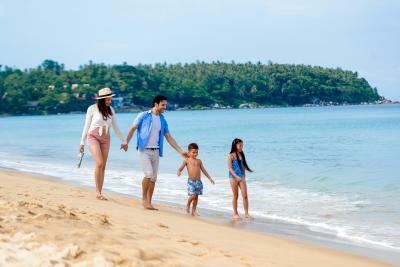 For family travellers, the resort offers variety of family activities and amenities; more information below. 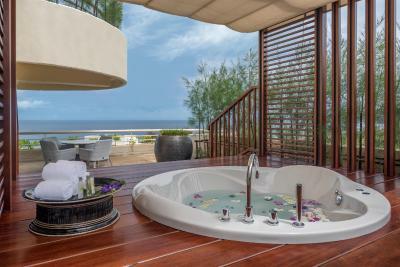 House Rules Hilton Phuket Arcadia Resort & Spa takes special requests – add in the next step! Hilton Phuket Arcadia Resort &amp; Spa accepts these cards and reserves the right to temporarily hold an amount prior to arrival. Hilton Phuket Arcadia Resort & Spa accepts these cards and reserves the right to temporarily hold an amount prior to arrival. Room AC was not working, Shoddy service with barely any effort from the Bell boys or staff and poor Check in experience. POOR CHECK IN EXPERIENCE: 1. No one guided us to the check in lobby. The property has two lobbies so its confusing. We had to drag our luggage and ask instead of the same staff coming forward to help 2. At the check in counter again there was no one to help with guiding us to the right counter. There was a makeshift counter put up but when we went there we were asked to proceed to a different counter. This happened twice 3. Having stayed at Hilton properties before I have come to expect little courtesies. But none here - not even a refreshing wet tissue ROOM DIDN'T HAVE FUNCTIONING AC AND IT WAS A POOR STAY EXPERIENCE: 1. Room AC was not working. In spite of that the room was assigned to us. 2. We actually booked this as a stay for our last day on holiday in Thailand so were expecting this to be a nice relaxing experience (especially considering it's a Hilton and even the prices are premium). But at 10 in the night I was having the call up front desk repeatedly until they finally sent an engineer to check the AC. Engineer said AC vent needs to be cleaned and left (see photo). I was to check out at 445 am the next day but instead of getting a good night's sleep I had to prod and complain to the reception for the next half hour until finally the manager got us a different room and 1030/1040 in the night. If a room with a functioning AC was available then why were we assigned a room where the AC was not working? Was it because we were booked for only a day and checking out early morning so the staff assumed it's okay? Nothing like the quality I expect from a Hilton .. 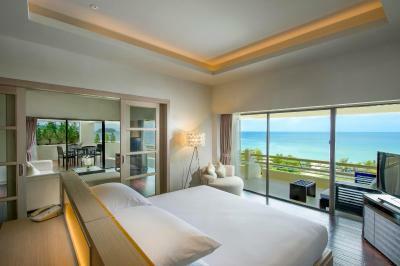 I was in Phuket and Samui over the past 7 days and had much better stays at the other properties. 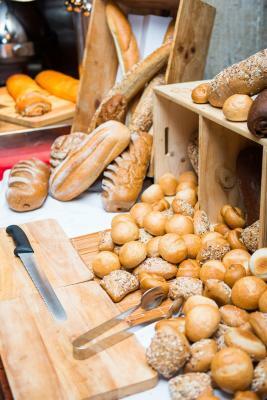 There were very few options for vegetarian food in breakfast. The air-conditioner in the room was not working and left us feeling stuffy at some times. The lamp in our room was torn, which I initially confused for a rustic look. The location and view from our room was fantastic, right in front of the beach. The hotel is spread over a huge area, and has buses running inside the property at all times to help transportation. There are multiple pools which spread out the visitors. Staff was extremely helpful, courteous and always greeted us with a smile. Sea was rough. Slow service. The bathroom looked very aged and the beach was not very clean. Breakfast was really bad....and the rooms had old interiors. Everyone was kind. Food was delicious. Rooms were comfy. The whole place is stunning. It felt like home. The hotel is quite old. Car parking is far from main building, need to take tram, which takes time to get in and out. Breakfast menu are nearly the same for our 5 nights stay and not much choices of food. 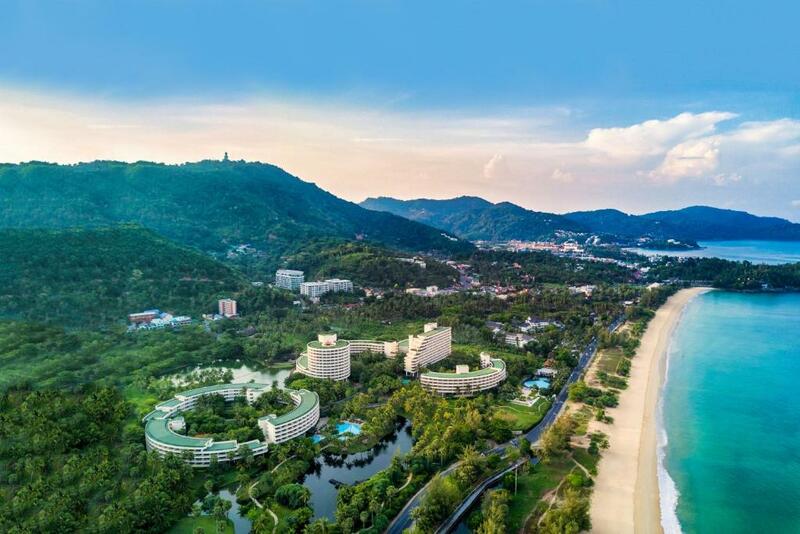 From hotel building to beach, you need to walk long way and cross the street. Again, we didn't have a direct access to the beech from the hotel but we had to go down the stairs (this could be slippery with wet feet) and then cross a busy road! having said that, most hotels in the area don't have direct access either. Also, we had a problem with the room allocation. we booked a sea-view room and paid extra for it. however, we were given a room in one of the hotel buildings which is facing another building! so, the sea view was blocked completely by this building. 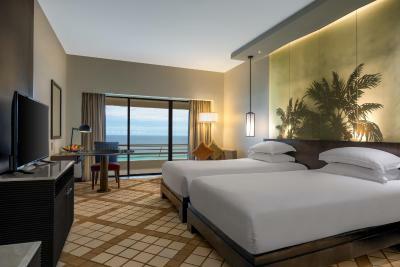 what was shocking to us is that when we checked in, we were told that they took into consideration all our requests and that they allocated this room to us because of it's good view and it's on 6th floor to see the ocean!! of course after we saw the room, we went back to the check-in desk and expressed our disappointment and insisted to honor what we paid for, a room with sea view! this in the end was changed, but we didn't expect to face such bad experience at such a reputable hotel. Hotel location was good, however, you don't have a direct access to the beech! 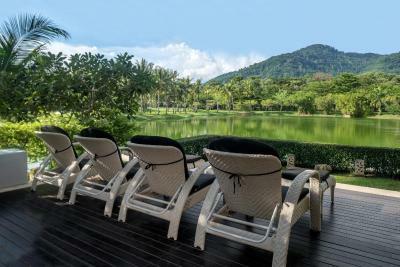 the hotel has a welcoming lobby which a bit far from the main hotel, but there is a very good shuttle service 24 hours. Loved everything. Beautiful resort, the gardens, several large swimming pool with slides for kids, lots of space, great kids club. The staf were very polite and helpful. The view was exceptional, we had a deluxe king plus seaview. Loved the breakfast. Housekeeping did an excellent job! All furniture is quite old. Also, there is no light on the ceiling. I turned on the lamps to light the room. Everything was great. Staffs are really nice and friendly. Especially, housekeeping is very considerate. Breakfast is great as well. There are not many kinds of food. But every dishes are good. Most of all, there are 5 swimming pools. So I could fully enjoy swimming. Also, some restaurants, supermarkets are close to the hotel. Airport shuttle. The first driver smelled like an ashtray. The second driver was driving very uncomfortably. I liked everything about our stay! We had a lovely holiday.